“I interpret your blogpost about the GQ men of the year as a way for you to make an association between a famous figure taking a stance that you disagree with, and known child molesters. I do not think these issues have anything to do with each other. Colin kapernick is controversial, but has staked a position on principle. There is no relationship between his stance, and Woody Allen’s known transgressions. “These are all men of the Left who look down on traditional Judeo-Christian thinking. These are the men who through their respective trades have taken it upon themselves to tell us little people how we’re supposed to think and feel. Surely there must be thousands of right wing priests that can stand with this lot Tom. Actually, 80% of the priest abuse scandal in the U.S. was homosexual in nature, targeted towards adolescent boys. I’m not sure how right wing they were in that light. More importantly, the Church did something about it. Today, priestly impropriety has been virtually expunged from the American Church. Most of the abuse took place back in the 60s through the 80s. On the other hand, abuse is epidemic in bastions of liberalism, including Hollywood and our public schools. You’re not off base, Tom. These individuals have announced that their behaviors are beyond the reach of anyone who feels offended by their arrogance. They don’t care who gets hurt. Well put, Tom. Blessings. The graphic says a lot but, your conclusion Tom, seems offbase and I agree with the reader pushing back. Kaepernick doesn’t have anything to do with these other men and their sins. 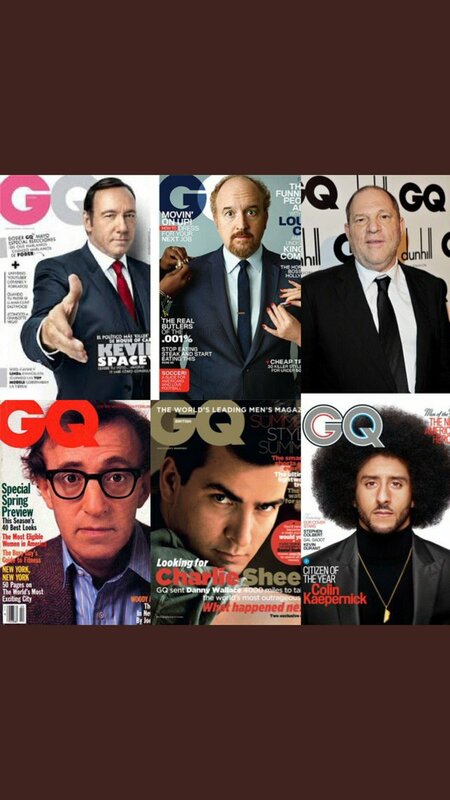 The graphic does, however, say a lot about GQ and who our culture holds up as a hero. In that context, the graphic is a good one.